Forgive me for being a tad behind on my food blogging since I got back from Hong Kong. I'm just terrible with jetlag. Despite going 3 or more times a year, it just never gets any easier adjusting back on schedule. If anyone has any tips for getting over jetlag, I'd love to hear them! Anyways, one of the more memorable meals of my most recent Hong Kong trip would have to be Oedo Japanese Restaurant 大江戶日本料理. There were 2 absolutely drool-inducing dishes during this meal that will be forever etched in my memory! Nice sashimi appetizers to start your meal off! Abalone Sashimi was very tasty. Sliced thin to perfection. Abalone is one of those things that the sushi chef has to prepare carefully. If sliced too thick, it can really create an uncomfortable texture and make it hard to eat and digest. Now this blew my mind. This was our kobe beef sashimi over ice!!! Amazing would be an understatement! You have my permission to drool now! Each bite was a rich, creamy explosion of goodness. Each piece of raw kobe beef sashimi was sliced so thin and then dipped into a ponzu sauce. The raw onions also made for a good chaser! Fatty Toro sushi was great as well. Now this was the second dish that blew my mind. I'm still looking at these pictures and drooling. Actually, this is my current wallpaper on my computer. Not. Ashamed. At. All. 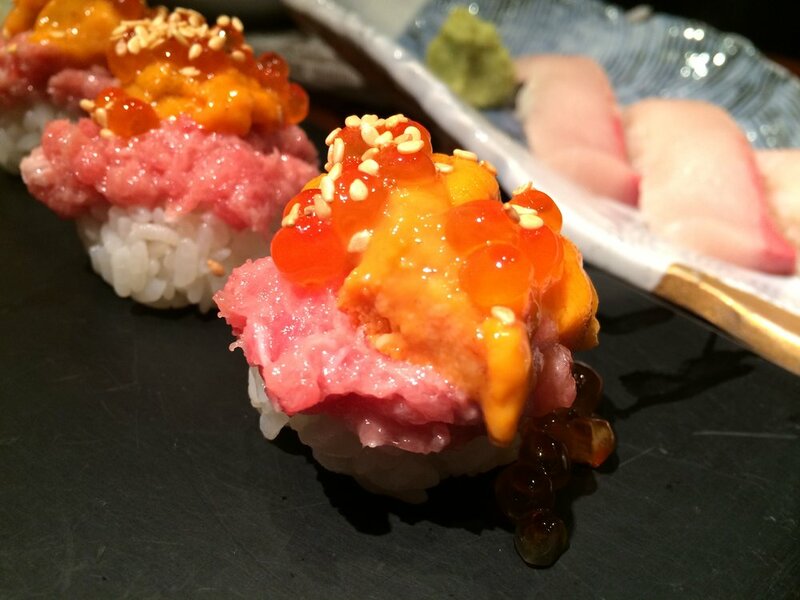 This was a fatty toro sushi with uni sea urchin on top, subsequently topped with salmon roe. Just look at those colors! Such a sight for the eyes and the mouth! So creamy. So tasty. Forever engraved in my mind and taste buds. Thank you! Grilled yellowtail collar. This was very tasty as well. The meat fell off the bones. Squeezed a tad of lemon juice on top and viola! Although this was good, this is something I regularly order at a Japanese restaurant so this didn't stand out as much as the Kobe Beef Sashimi over ice and the Fatty Toro Uni Salmon Roe Sushi! Gotta have veggies! Stir-fried veggies. Fatty Tuna Hand Rolls. Can you tell I really like Fatty Tuna? Of course, I had to have ramen. You know how much I love ramen! I ended my meal with not one, but two ice creams. Yes. Why not? Green Tea and Black Sesame Ice Cream!